March 2012 – Rotary exists to serve the local and international community and the Community Service Committee is promoting the ICE scheme throughout Gravesend. ICE is a system which enables the emergency services to identify your next of kin or the person to be told if you are in an accident. The idea is that you store the word ICE and the name(s) of your contact(s) in your mobile phone followed by their phone number exactly as you would enter the name and number of anyone else you want to contact. so that when the Police, Fire or Ambulance Services arrive at the scene and find your phone they will look in your phone directory under the letter I and lose no time in telling the right person about your accident if you are unconscious or unable to speak. ICE started following the London bombings in 2005 when time was lost in contacting the families of the victims. The idea soon spread world wide and is now operating in countries as far apart as America and Australia. But research has shown that the numbers of phone owners has increased in size and age range with young school children regularly having a phone in their school bag.. At the other end of the scale the number of older phone users is increasing and are more likely to need assistance following a fall or accident and this present scheme is aimed at making them all aware of the need to carry an ICE number. 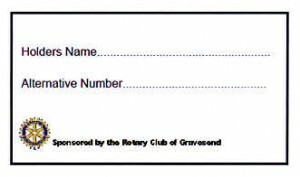 For those who do not have a phone the ICE information is printed on handy sized cards (as illustrated here) available from the Rotary Club of Gravesend for you to fill in the ICE number and to carry in wallet or purse. 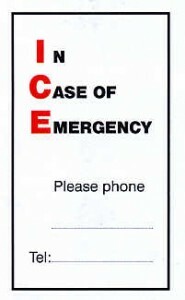 If you have not got a phone and cannot get a card, please make sure you have an ICE number on your personal identification documents such as driving license or other card.